First of all, I know the quality of this photograph is terrible. I do apologize. It’s because this picture was taken a while ago with my iPhone, and I just figured that I had to share this cool recipe with you! 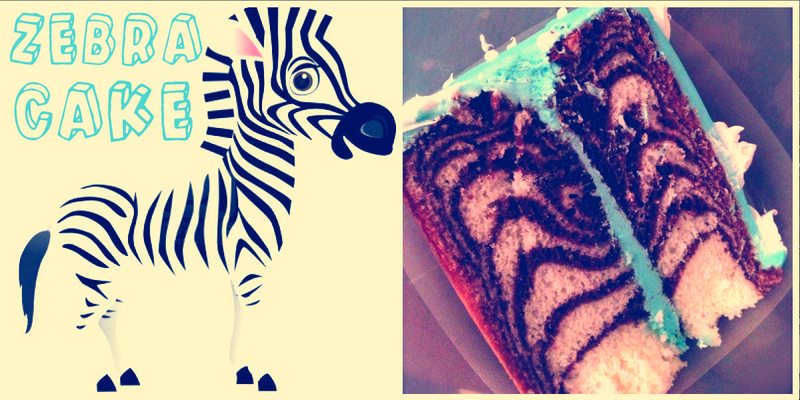 I’m sure a lot of people have seen this zebra cake before, but for those who haven’t – check it out! Make sure each cake batter is in it’s own bowl. Vanilla in one bowl, chocolate in the other. Start by dropping 1/4 cup of vanilla batter into the middle of an 8″, greased pan. It will spread a little bit. Repeat this process, continuing with 1/4 cup scoops of alternating flavors, each flavor of batter dropped into the center of the previous circle of batter. The batter is thin enough that it does not take long at all for the batter to spread out a little bit.